Taste (and indulge in) and judge six different punches. If that's not enough, there will also be as much Hot Buttered Rum as you care for served by RumDood himself (he's the one in hawaiian shirt and fedora hat). And of course, snacks to keep you afloat all that rum you're drinking. For just $12, that could be you hot and buttered up in the middle of Malo Cantina this Thursday! It's fun seeing your friends go places. 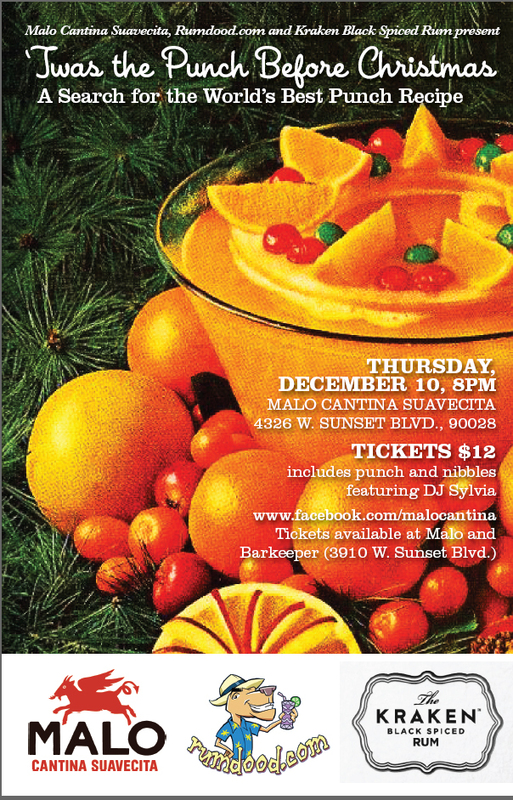 Like when blogger friend RumDood goes to hold his first ever LIVE punch competition at Malo Cantina this coming Thursday, December 10! But alas, since I can't be there to see it for myself, I was hoping blogging about it will send some of you guys reading there. Hopefully sending a proxy will make up for me not showing up. In other words, I want all of you to go there on Thursday and get punched up! I don't see why you would refuse.